It may not always be clear what kind of site you are getting when you call a web design company and request an estimate. I talk to people all the time that have gotten an estimate to build a WordPress site for their company’s website for $900-1,200. They do not understand why I would quote the same job for $4,500. Obviously, it isn’t the same job. This issue got me thinking about how a customer can go about understanding an estimate, what questions to ask, and how to evaluate the available options. That’s the topic I tackle in today’s post. 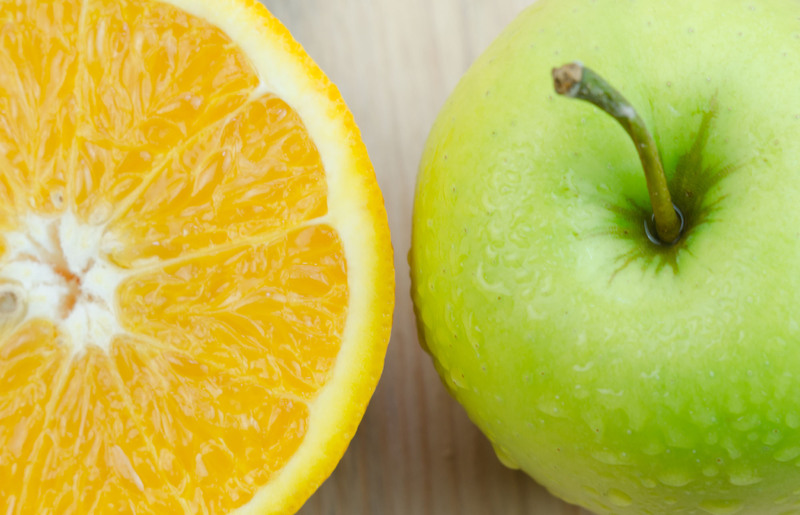 In the world of WordPress websites, what’s an apple, what’s an orange, and which is the best for your company? Before we can get to the apples-to-apples issue, we first need to discuss two primary methods available in building a WordPress website. Once we have outlined the options, we’ll look at the pros and cons of each approach, including the impact in each case on price point. There are two basic ways you can build a WordPress site: theme-based and fully custom. For the sake of this explanation, I am defining theme-based as starting with an existing theme and customizing from that starting place. Technically, all WordPress websites are theme-based, but the issue is whether you code the theme from scratch or begin with something that starts off some significant way down the programming path. In this scenario, the process starts with a design meeting where the goals, branding, colors, imagery, and content of the site are discussed and prioritized. Based on the findings from the design meeting, a designer creates a site design in Photoshop that best matches all those goals. There are no limitations on the design and it is done completely from scratch to the specifications of client’s needs. The client provides feedback on the design layout and elements and revised mockups are presented. This process continues until the design is exactly what the client wants, and the client accepts the design. At that point, the accepted photoshop design files are used to develop a custom WordPress theme that brings that design to life. That theme is programmed from scratch. It is completely unique to the client’s site. This approach is trickier to evaluate side-by-side because there are different levels of customization. At the bottom, you could simply put a company’s logo in the header and add their content to the pages of a pre-existing theme. That process could be completed in 3-6 hours, depending on the size of the site. This end of the spectrum obviously has the benefit of being least expensive and fastest to launch. The primary downside to this option is that you end up with a website that someone spent only a few hours developing. It will look like it came together in only a few hours. There may be cases where this is sufficient for your business needs, but in most cases, the client will be left unsatisfied. I have found, in almost 20 years of building websites for businesses, that clients may have a low price point in mind, but the website they have in mind for their business is at a much higher price point. Because of this disconnect, we made the decision years many years ago not to offer this level of service (or lack thereof); no one ends up happy. If you have gotten an estimate for your new website in the $1,000 range, it is likely this level of service. At the other end of the non-custom range is a highly-customized theme-based site. With this option, the developer starts with a basic theme and creates a unique and professional website for you from that starting point. In this case, the theme is used as a platform or a builder and not as the end product. This approach offers a good blend of customization with a faster, and therefore less expansive, build. We find that this type of WordPress build is a great fit for many of our clients that do not have the budget for a fully custom website, but require something highly professional with loads of service and support. Which Approach is Right for Your Business? Determining which of these approaches is right for your business depends on your goals, budget, and available timeframe. Keep in mind that you will be happier with more service. But, those additional hours of thought, planning, work, communication, edits, design, and programming cost more money. Ultimately, you must weigh the various factors of development time, customization, and cost to decide which build type is right for you. Armed with a better understanding of the various ways to build with WordPress, we hope you find it easier to define which is right for you and obtain bids for your project that are same-same. As always, contact us with any questions. We are here to help! © 2019 dandelion marketing LLC. All Rights Reserved.